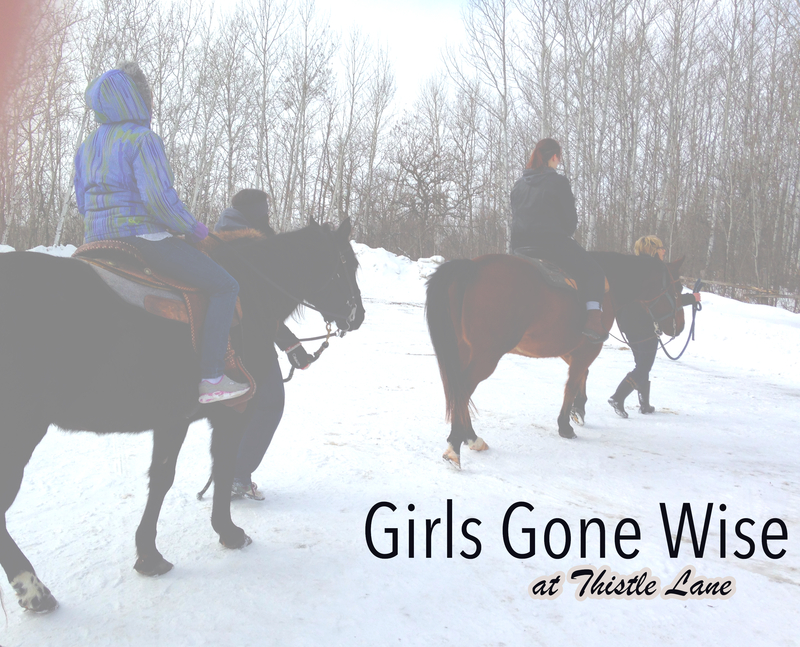 Thistle Lane Guesthouse offers a retreat weekend package for young women called Girls Gone Wise. We have teamed up with our local church to offer a Christian Ministry directed at young women from the ages of fourteen all the way to college age. The possibility of doing a mother daughter retreat would be a welcomed idea, for there are many biblical truths we address that are for women of all ages. 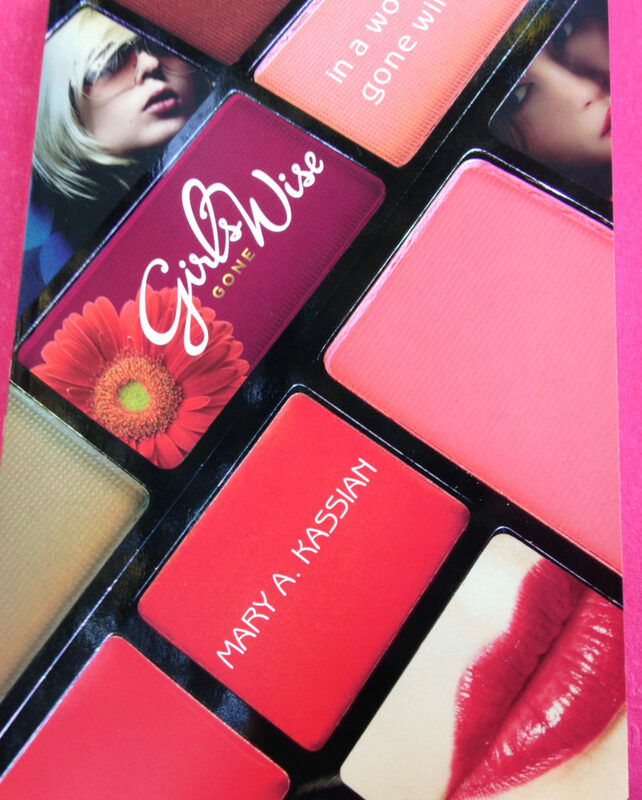 The book called Girls Gone Wise in a World Gone Wild, is written by Mary Kassian an award winning author and well know speaker. It has twenty main contrasts between wild and wise that we touch on throughout the weekend. We have divided those chapters into four main teaching sessions, due to the time involved, this retreat weekend is a condensed version of the book. 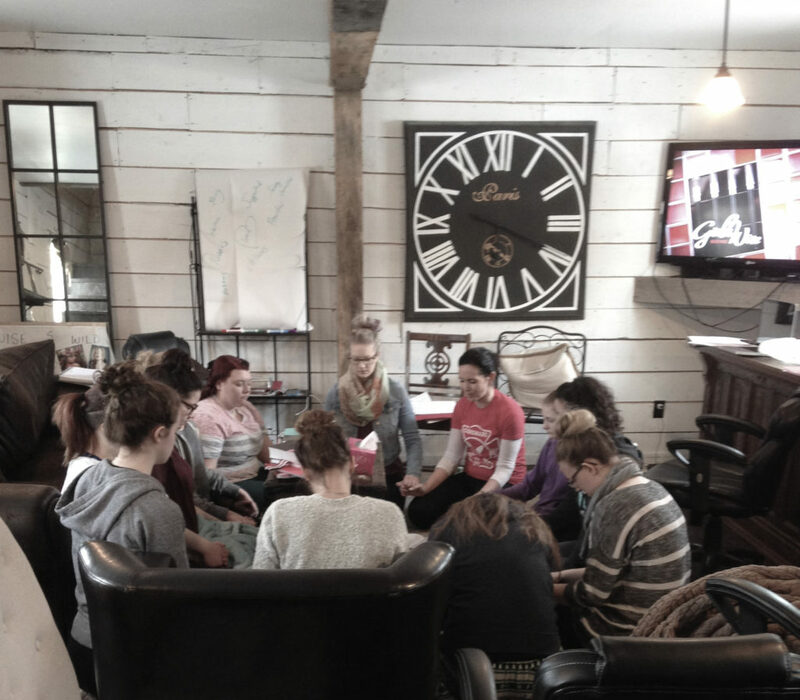 According to scripture there is a measure of “Girl Gone Wild” in all of us, this retreat is designed to help young women discern between wild and wise decisions, learning about God’s design for womanhood. Our young women have a tremendous amount of pressure to conform to the world’s patterns and standards. We would like to empower young women to choose God’s biblical truths as their moral foundation for spiritual success in their lives.It seems there are so many of us living with brokenness, dysfunction, and pain and without clear direction of what the bible tells us when it comes to being a women of God. 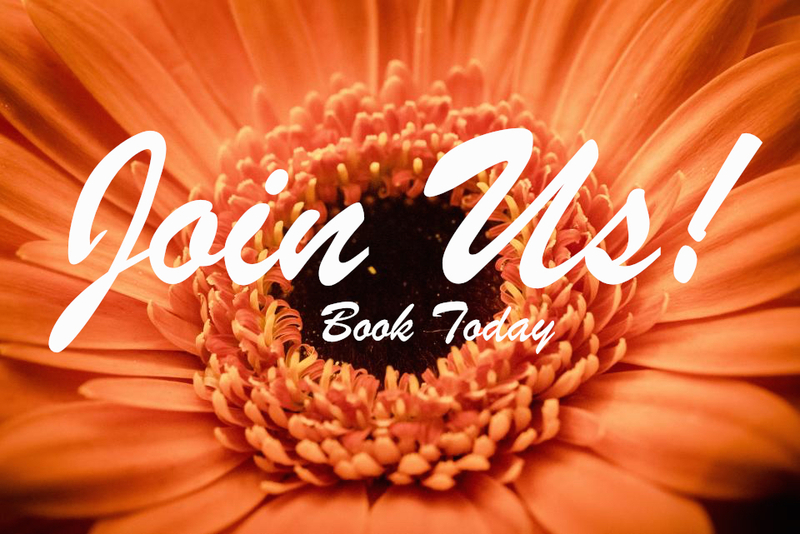 This retreat will be offered as a private booking at the Bed and Breakfast for any group of young women, it is taught by qualified leaders, who are actively involved in our local churches. We are very clear in presenting the plan of salvation, the girls are asked to bring along a bible, if they do not have one they will be given a bible as a gift. The teaching sessions are hands on with a variety of video segments, sharing, question/answer and referencing the Bible. What’s included in the retreat package? Please call for pricing, and any other questions you may have! We require a minimum of 5 women and a maximum of 9 women, including chaperone/ youth leaders. We hope to see you this fall/winter! A family and guest favourite that we just had to share! In a large bowl add water, sugar, eggs, oil and salt. Mix and then add 3 cups of flour and mix. Add yeast into the rest of the flour. Stir it in. Add to the mixture until the dough pulls away from the bowl. Turn onto floured surface and knead the dough until smooth and not sticky. Roll out dough and spread with butter. Sprinkle with brown sugar and cinnamon. Roll up and slice to desired size. Boil together cause ingredients for 30 seconds. Add pecans and pour onto 2 (9×13 inch) greased pans. 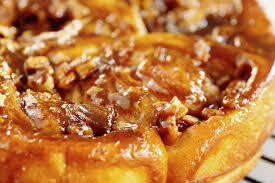 Arrange cinnamon buns over top of the sauce. Cover with tea towel and let rise for about 1 hour. Bake at 350 for 25-30 minutes. Turn onto sheets of foil to cool. Enjoy these delicious treats morning, noon and night! 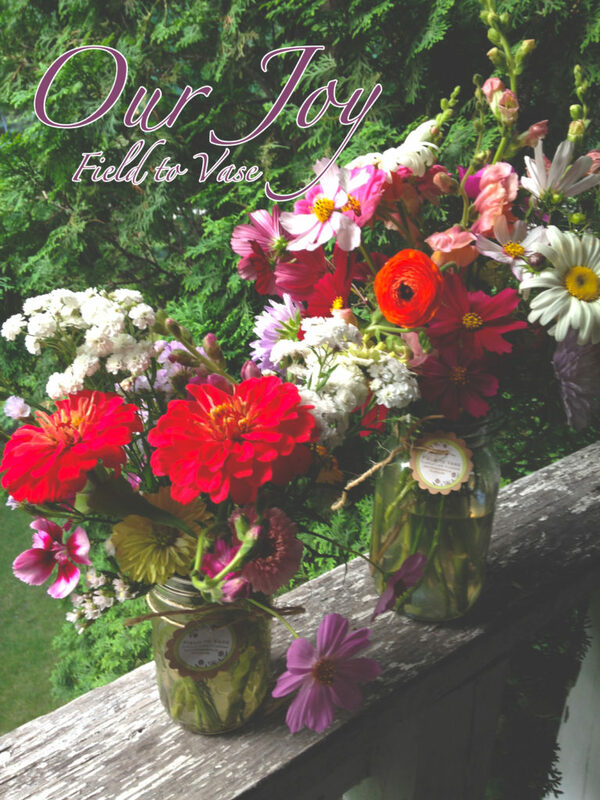 Let’s start from the beginning, why flower farming? Well, two summers ago I started to cultivate an outdoor riding area which was to be my riding coral. Last summer, I worked my horses in this particular area but something was not quite right, the dirt was very nice. It had a lot of organic matter (old hog manure) which caused me to think, I should really be growing a garden in this location. We can always put the riding ring beside the garden, why not! 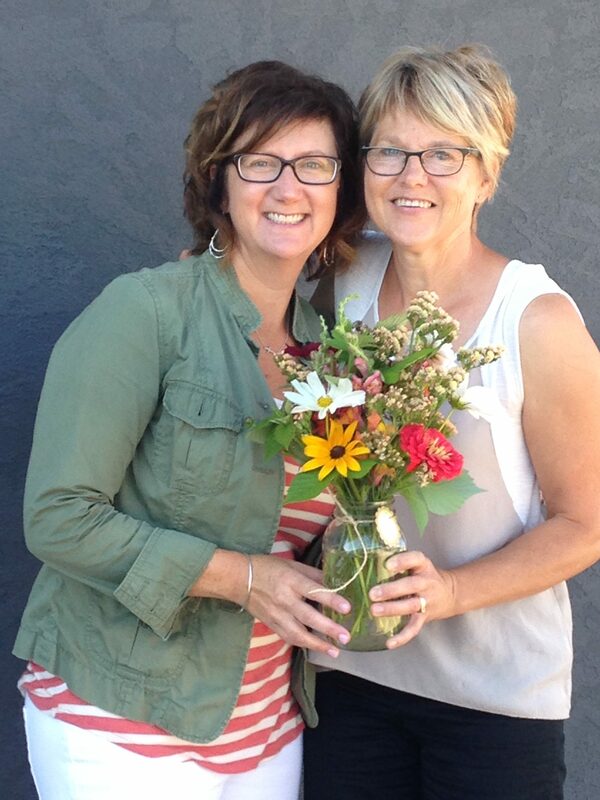 Since vegetables did not pull at my heart strings, that left me with flowers! So the research began and ever since then, I have not looked back. I learnt as much as I could, plus with a little bit of seed knowledge from my young married years, I moved forward with this exciting new venture! I began most of the seeds in my basement under lights and by April, I moved all my seedlings into my old green house. Things were starting to look promising. Early spring, we put up temporary fencing to keep the horses out of the garden and give definition to the space. Then, it was time to put the baby plants into the new garden. Planting a few thousand seedlings actually should be classified as a sport, because I felt every muscle in my body and found a few that I was unaware of. Next year the plan would be to train physically prior to this spring time event so that I’m better prepared physically and mentally! The first year of flower farming has been a learning curve. It seemed as though germinating, transplanting, and growing in the greenhouse was the easy part. Once the transplants hit the dirt, I thought they would take off; it was not so easy. Learning what kind of soil and its drainage was most important. Eventually, after a slow start we started producing flowers and at times more than my market could use! 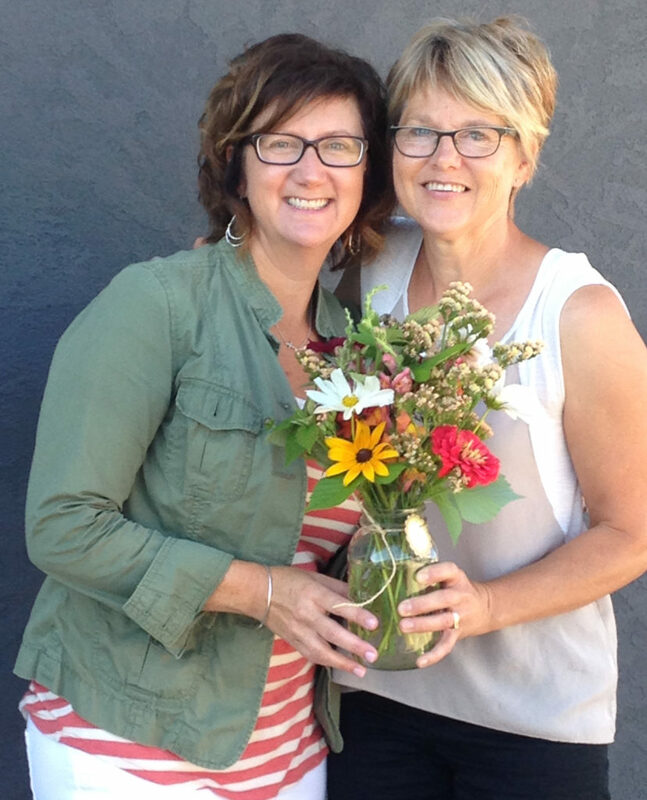 Thanks to good friends, they received a few flower gifts along the way. 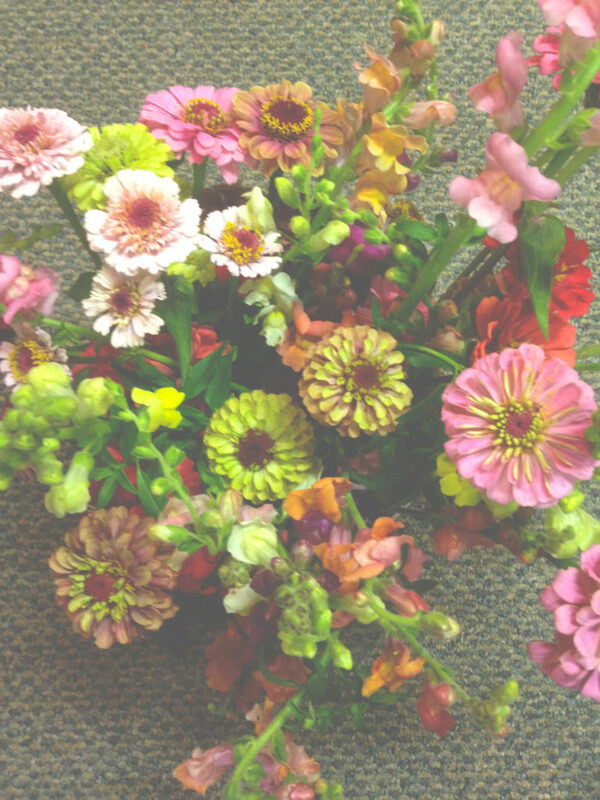 There is a sweet joy that these home grown flowers bring to my soul. I can’t explain it, you can just feel it. The season is almost done, and I can hardly wait to start again next year! Closing our doors after twelve years of successfully running Thistle Lane Cafe & Giftshop left me with a large building on our yard. The building was very cute, but none the less it needed a new identity. 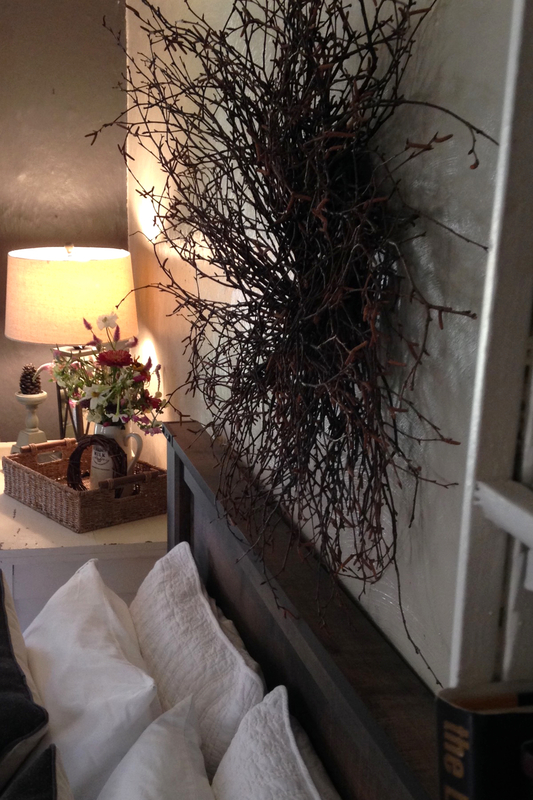 We decided to perform a three month renovation and turn it into a bed & breakfast guesthouse. 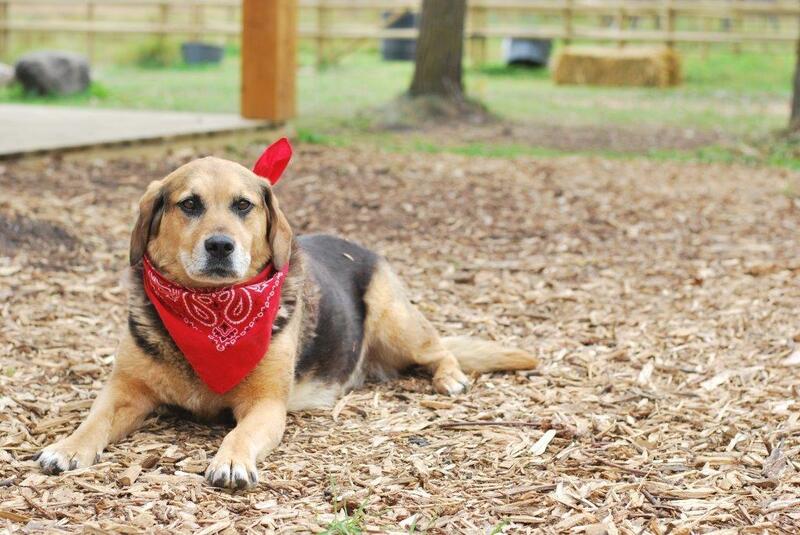 The theme was of course was rustic country. It already had the bones of a 1921 farmhouse, we just needed to add a little modern touch with some updated beds and couches and away we went! Venturing into the B&B industry in 2013, has been a rewarding three years. The first year was a little slower than I had expected, but since then things rapidly went into high gear. 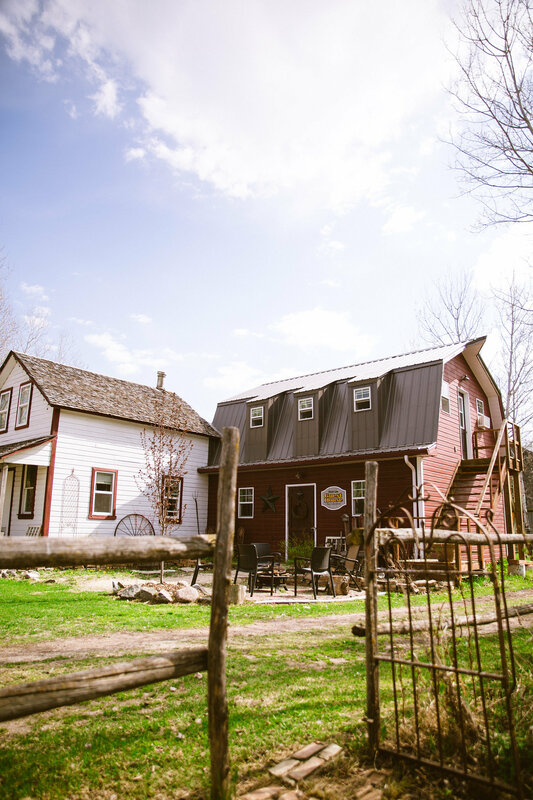 We operate a 2000 sq ft guesthouse, located on 130 acres of Manitoba prairies, surrounded by all of our little hobby farm residents. The guesthouse has been a happening place with everything from quilting / scrapbook retreats, to Girls Gone Wise Weekends. In the summer months, we are blessed to host many brides and their bridesmaids, tourists and visitors. The summer is definitely our busiest time of year! 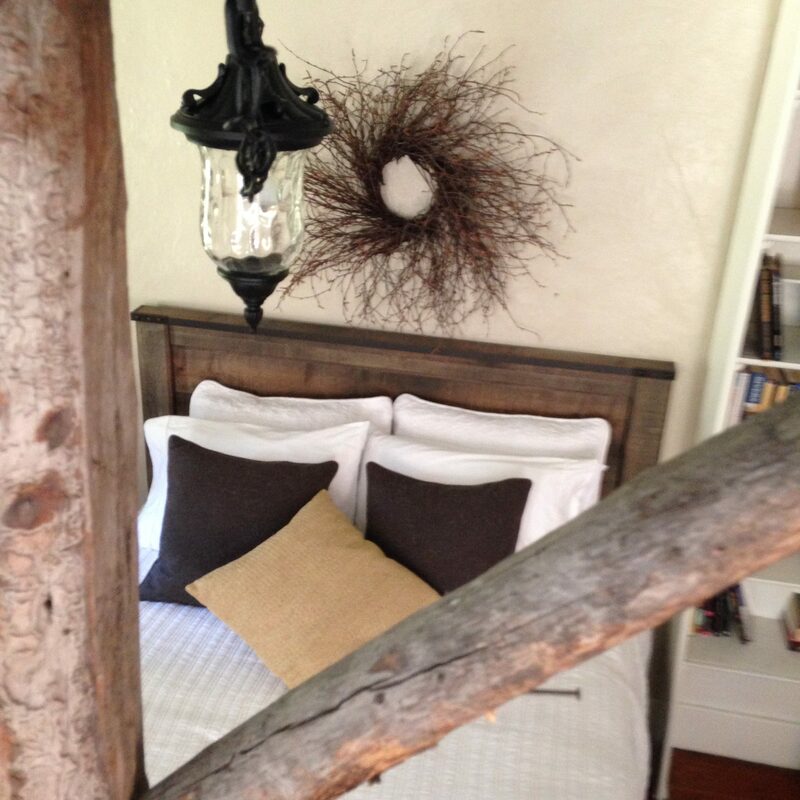 The barn loft houses two queen beds along with a pull-out couch which allows for occupancy in the loft of up to five. The farmhouse attic, has a double and a single bed, which sleeps two. The way we were setup worked great, except we were missing a main floor bedroom. An existing room, which was a sitting room with a sleeper couch, was very often unused, so this lent itself perfectly for a main floor bedroom. 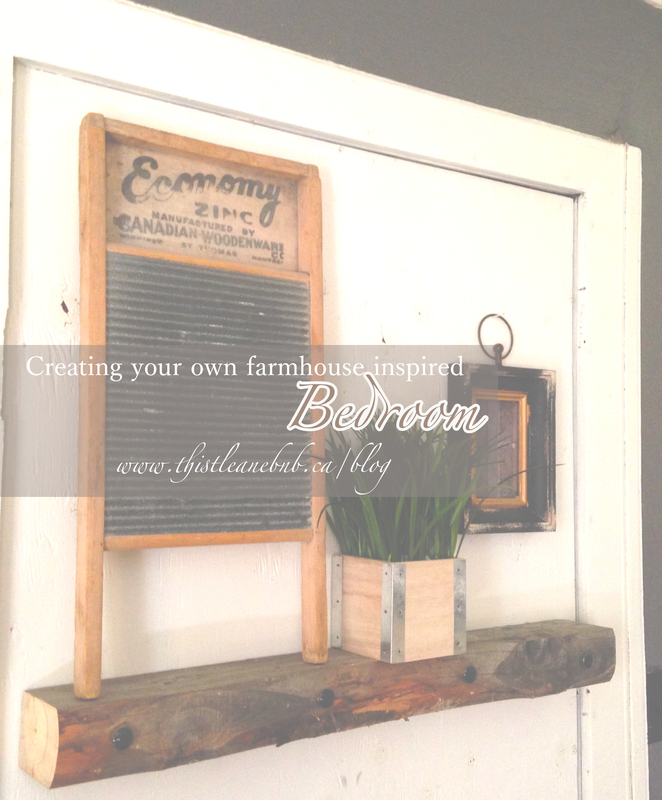 Transforming this room into a country oasis was nothing but fun! The stage was already farmhouse country, with the wood boarded ceiling and plaster walls. The next step was to find a simple bed that continued the already rustic tone. The hunt for bedding is most often a challenge, you have to come to a place where the idea in your mind meets the product that the stores are selling. That of course requires more than one shopping trip, which is difficult with my limited time. Throw into the shopping trips, pillows that match but don’t match, a light fixture that is in your price range, but that is simple enough to represent the 1900s and a throw that casually pulls the room together; making it look like it had always been there. 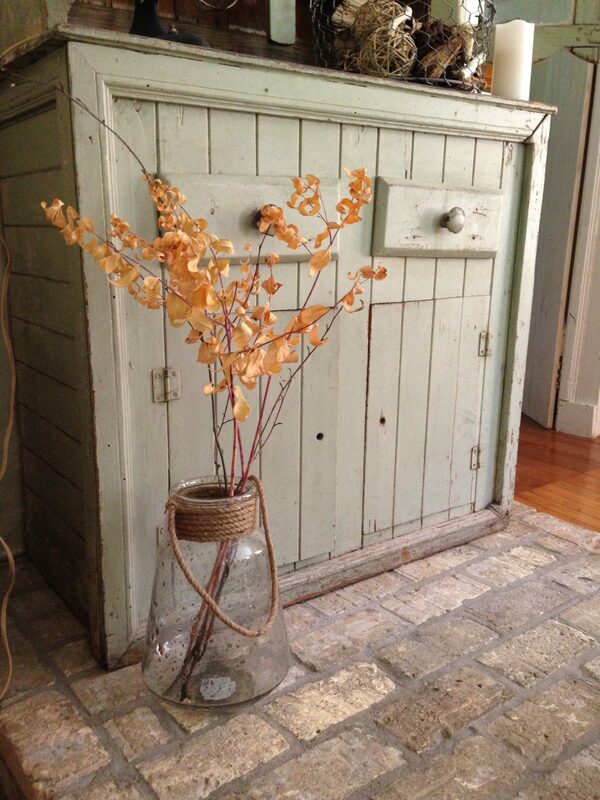 Oh the joys of making a comfy cozy country retreat! In the end, the result was a beautiful rustic retreat, that creates a feeling of a relaxation and simple joy. Choose a muted lighter colour throughout your room. Experiment with what you have then add what you need. Sometimes moving items can change the feel of the room. Use objects in unexpected ways. Create a layered bed with use of matched and unmatched pillows, along with patterns and textures. 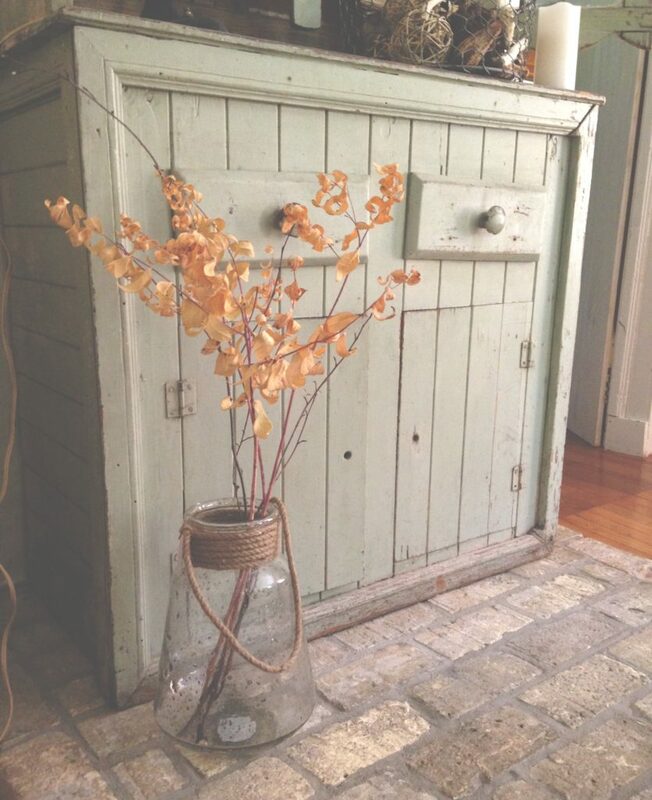 Remember the farmhouse style is flexible, so have fun! 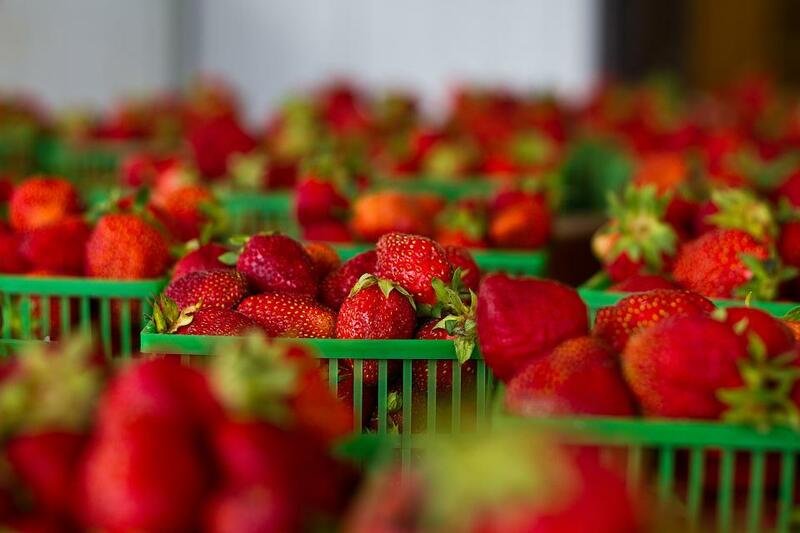 At Thistle Lane, strawberry season is one of our most favourite times of the year! There is nothing more delicious than a fresh strawberry cream pie. This recipe is amazing and definitely the most popular for our family! Stir the strawberries with the glaze in a bowl and place in the refrigerator to chill. Stir the cream cheese, icing sugar cinnamon and vanilla in a bowl (if your cream cheese is cold warm up in microwave for easy mixing). Beat whipping cream with electric mixer until thick and then add the cream cheese mixture to whipping cream; continue to mix. 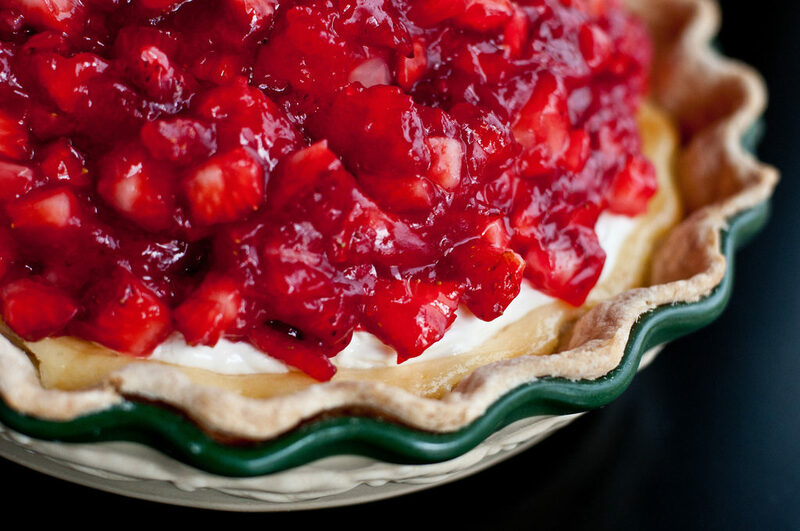 Pour the cream cheese mixture into baked pie crust and top with strawberry mixture. Chill for at least one hour before serving. Enjoy! Are you looking for the perfect country getaway? 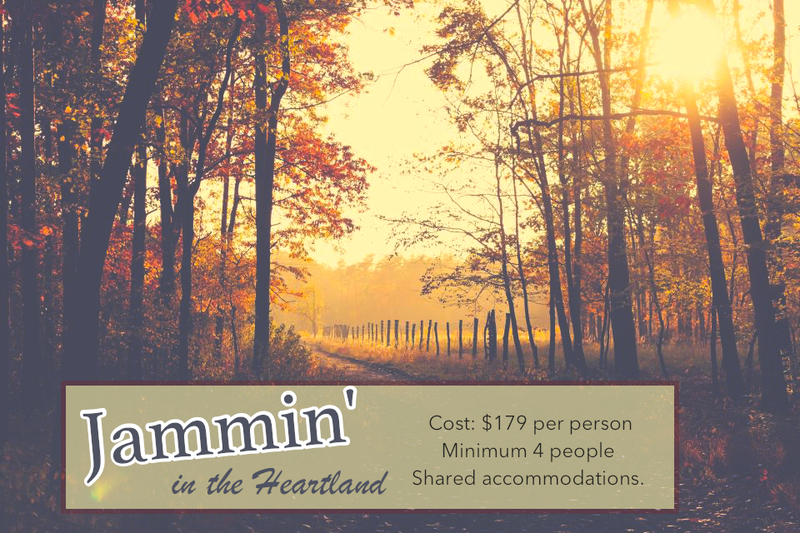 If so, Jammin’ in the Heartland is a getaway package which was created to bring the guest a unique prairie experience! 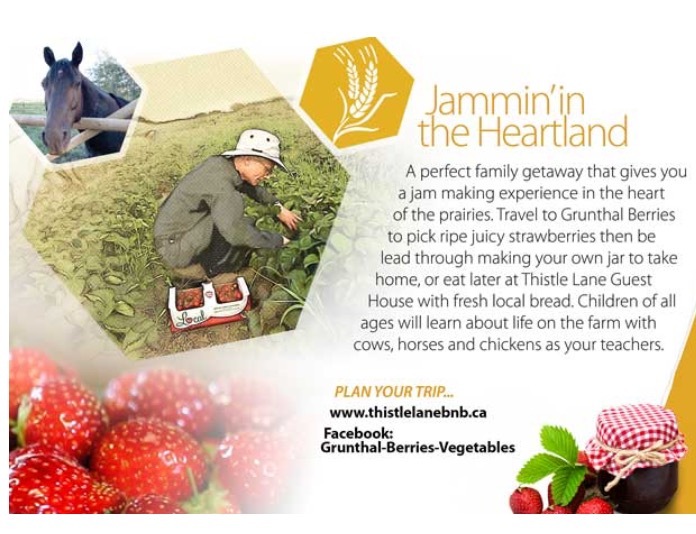 This little country vacation is a collaboration between Thistle Lane Guesthouse, Grunthal Berries and promoted by Eastman Tourism. The weekend package is a two night stay which includes 2 breakfasts, feeding the chickens and picking eggs, feeding sheep and brushing the horses. All of this with added tips on animal care and tidbits about our favourite animals. The cats and resident dog Daisy will be lazing nearby while also waiting their turn for affection. Our miniature donkey Maria is always ready for a brushing, as it is to be accompanied by a treat! The animals are available throughout your stay or if preferred, you are welcome to relax underneath the veranda at the horse barn. The morning starts with a full country breakfast of your choice, as a hearty breakfast is much needed for the day ahead! The berry picking and farm tour at Grunthal Berries will be available on the second day of the package which will take about an hour and a half. After the tour, you will be returning to the guesthouse accompanied by Colleen (owner of Grunthal Berries) and she will be teaching an “all you need to know” class in a jam making. This of course will be hands on! After the jam is completed, the best part is to come! Taste testing on locally made fresh bread with a cup of coffee or iced tea. Yum! The taste of fresh jam truly does create a yearning in us for simpler times of days gone by. The Guesthouse has a fully equipped kitchen that you may use to prepare your evening meals. Please relax and enjoy the beautiful country atmosphere by making a bonfire and gaze at the stars or even settle down to watch a movie inside. In the morning, you will be again greeted with a country breakfast of your choice. You will have the opportunity to once again feed the animals and say our goodbyes until the next time! To see the full video clip click here. We hope to see you soon! 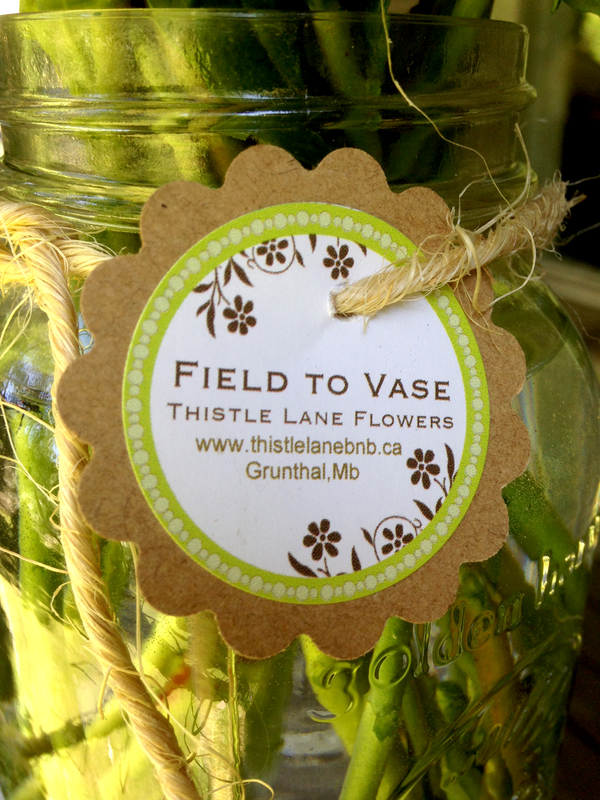 Thistle Lane Guesthouse Bed & Breakfast is the perfect place to host your pre-wedding activities. 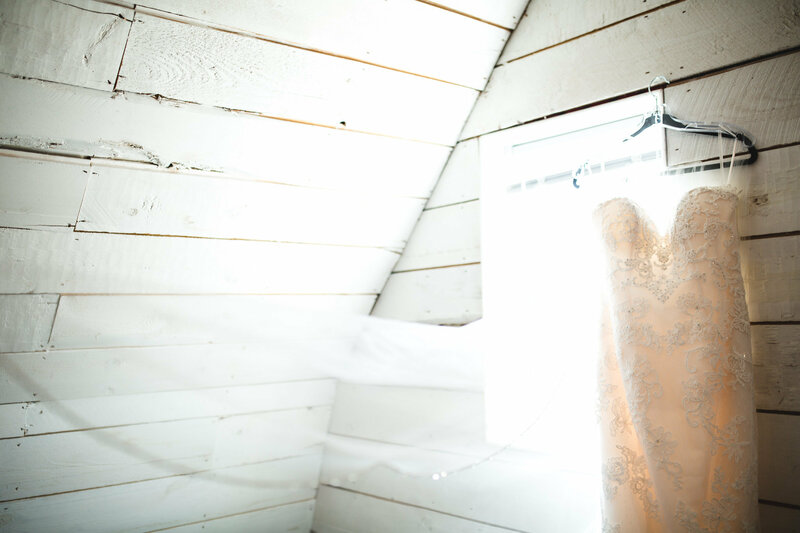 It’s where rustic meets modern simplicity; creating an atmosphere that compliments each wedding style. The charm of the guesthouse and its surroundings lend itself to an abundance of photo opportunities. The rustic fence, tall popular trees and gorgeous winding driveway all add to the beauty and tranquility to your dream day. Excitement could be felt in the air with the arrival of our first bride of the season! 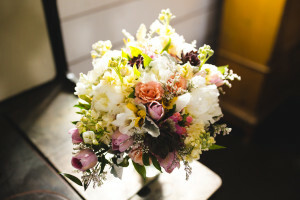 There is much to say about love, but nothing compares to the anticipation of a bride awaiting the arrival of her big day. 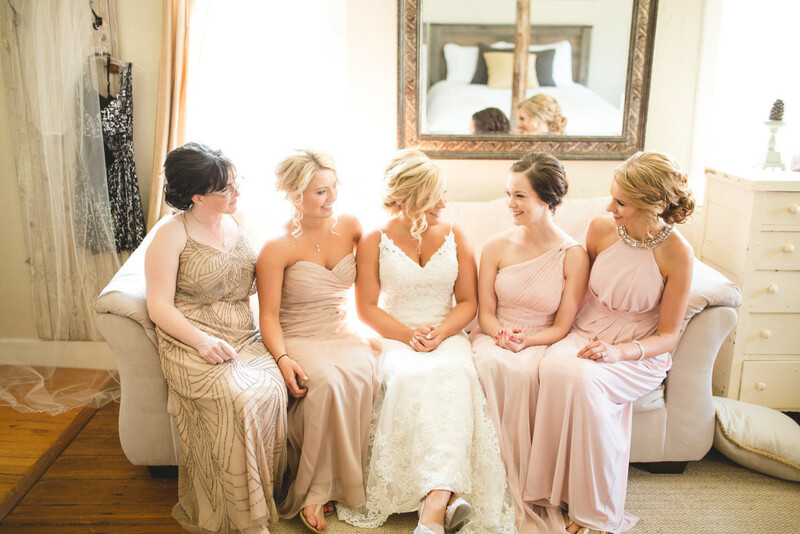 The evening before the wedding, the bride is surrounded by her closest friends. 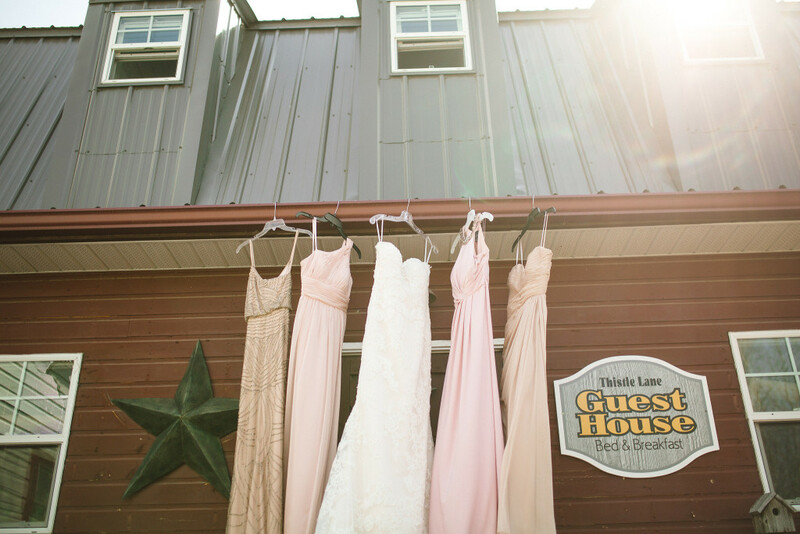 They enjoy the guesthouse and prepare the final details by hanging up the bridal gown, the bridesmaid dresses and admiring the small elements of elegance of jewelry and shoes. The much awaited date has finally arrived! Amongst the chatter and laughter, the joy the bride feels is absolutely contagious, and leaves no doubt that the weekend will be festive and amazing! The morning of the wedding is met with a four course breakfast, which is prepared and served, according to the bride’s schedule; after all it is her day! During this time or shortly after the hairdresser and make-up artist arrive, which creates another element of excitement to the day’s activities. 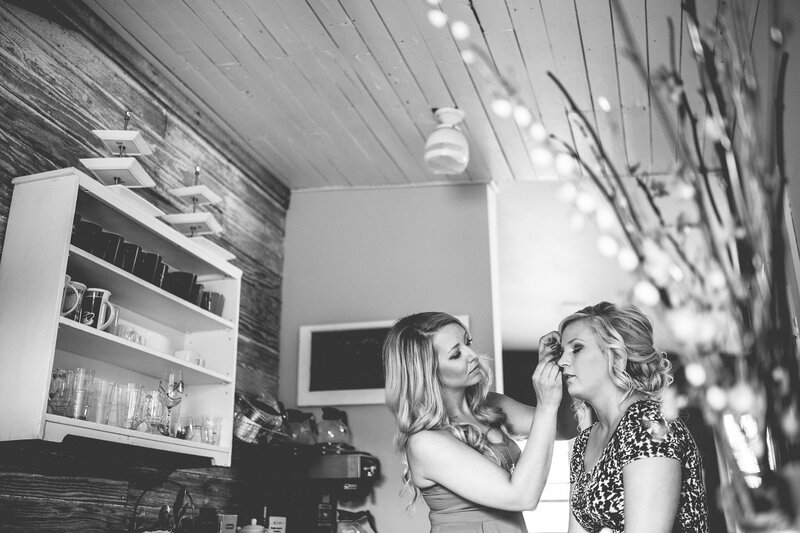 As they work diligently to achieve beauty for this very special event, there is often extras going on. The flowers get dropped off, the mothers or other family members gather, the photographer is busy scouting places for photography, all the while taking candid shots of the bride. The mother and daughter have their time with the final bridal gown fitting; our country guesthouse is buzzing with excitement and activity! Depending on the bride, often times the groom and the groomsmen show up, looking ever so handsome, trying to be unaffected by the excitement, awaiting their turn with the photographer. When the men arrive, the atmosphere changes, it’s show time. Before the bride and groom can meet, there is much planning for the first look. This very special moment captivates us all. It is a glimpse into the couple’s heart and it’s the moment that makes all of the planning and stress of a wedding worth every single effort. Just as quickly as the bride arrives, they are whisked away to the wedding venue where all their friends and family await. The festivities to celebrate two people who fell in love continues way into the night! 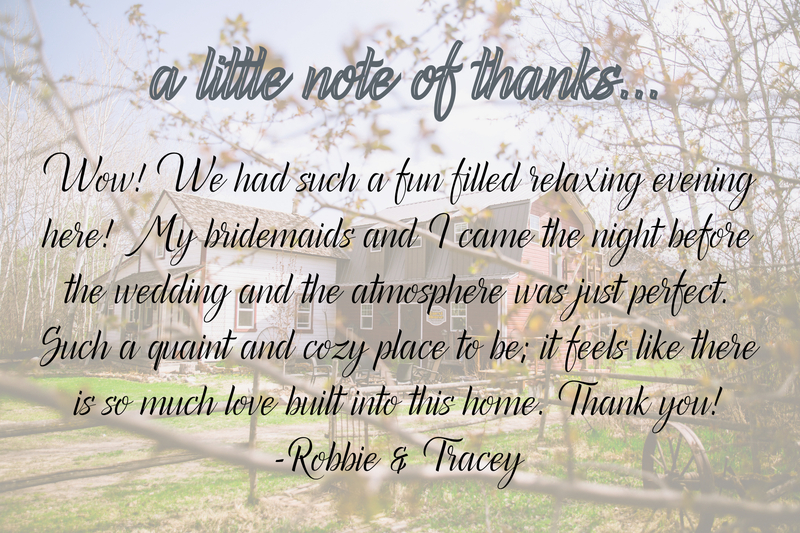 Thank you to all of our couples for trusting Thistle Lane as your pre-wedding home. We absolutely love being a part of your special day and cannot wait for all of the weddings this season! Allow enough time to get ready, always takes longer than you think! *All photos by David Bryan Photography. Special thanks to David and to our beautiful bride for letting us share these memories!